Children, and even adults, often carry glow sticks during Halloween or at events where it is dark outside or the lighting is dim indoors. 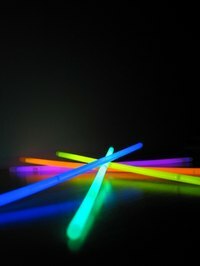 Glow sticks are not only toys and decorations, but safety tools as well because the glowing sticks are easy to see in even the darkest environment. Glow-in-the-dark pigments, which are activated by light exposure, are largely made up of phosphors that create the glow effect. Applied to clothing and other fabrics, glow-in-the-dark paint makes the wearer more visible. Press clean clothing items that you want to glow, using a clothes iron, to provide a smooth surface. Prepare objects, like hats, that can't easily be ironed by making sure they are clean before you begin to paint. Fabric glow-in-the-dark paint is non-toxic and there are non-flammable brands available, but supervise children during use to prevent them from ingesting it. Apply glow-in-the-dark paint to your items. To do this, remove the screw-top cap from your paint and apply it by squeezing the tube so paint runs in beads from the applicator tip. Paint new shapes or words onto clothing or trace over words and images. Paint the palms of gloves to make your hands glow in the dark. Use a brush for covering large areas to save paint. Apply the paint directly from the applicator tip if you are writing words or outlining shapes. Allow the items to dry on a flat surface and do not move them until the drying time suggested by the paint manufacturer has passed. Place your painted object in direct light, following the paint manufacturer's suggestions for the recommended time to produce the brightest glow. You can expect your item to glow for at least 12 hours and up to 24. The phosphors in the pigment can be reactivated by additional light exposure once the paint stops glowing. Do not use glow in the dark paint directly on your skin. Follow the manufacturer's warnings and instructions completely when using glow-in-the-dark paints.